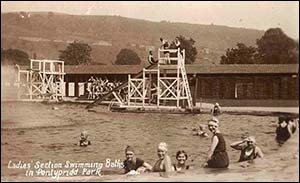 The lido in Ynysangharad War Memorial Park, Pontypridd, was opened on 30 July 1927 to encourage children and adults to take part in healthy outdoor activities, at a time when heavy industry dominated the local landscape and polluted the environment. The outdoor swimming pool was the jewel in Ynysangharad War Memorial Park’s crown. Among the earliest swimmers to plunge into its bracing water was Jenny James. Her swimming abilities were noted at the age of seven, and she was a lifeguard at the lido as a young woman. In 1951 at 24 years of age, she was the first Welsh person to swim across the English Channel in a time of 13hrs 55mins. 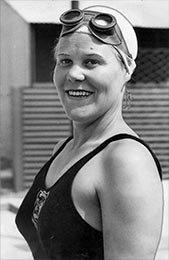 During her career as a swimming coach and lifeguard she was credited with saving more than 100 lives. She lived in retirement in Rhydyfelin, Pontypridd, and died in 2014, aged 87. The singer Sir Tom Jones, who grew up in nearby Treforest, also swam at the lido as a youngster and reminisces of ‘Ponty baths’ in several publications. The Lido was open from 1927 until 1991, when it became derelict. However, it reopened as ‘Lido Ponty’ in 2015 after a £6.3m restoration funded by the European Regional Development Fund through the Welsh Government, Heritage Lottery Fund, Cadw and Rhondda Cynon Taf CBC. The Lido now boasts modern facilities including three heated swimming pools, showers and heated changing rooms – so no more shivering and chattering teeth! Many of the lido’s original features have been restored to their 1920s appearance, including the Arts and Crafts architecture including Mediterannean-styled roof tiles, wooden cubicles and the original turnstiles. To learn more about the lido’s history, take a look in the visitor centre above the Lido’s Waterside Cafe. The visitor centre is open all year round, while the swimming pools are seasonal. Follow the link below for details. Alongside the Lido is a new adventure play area for children which includes features celebrating the area’s industrial heritage.